This event "4 Years Love On The Rocks" @ Salon - Zur wilden Renate has already ended on 07/20/2018. Here you can find upcoming events for this location! 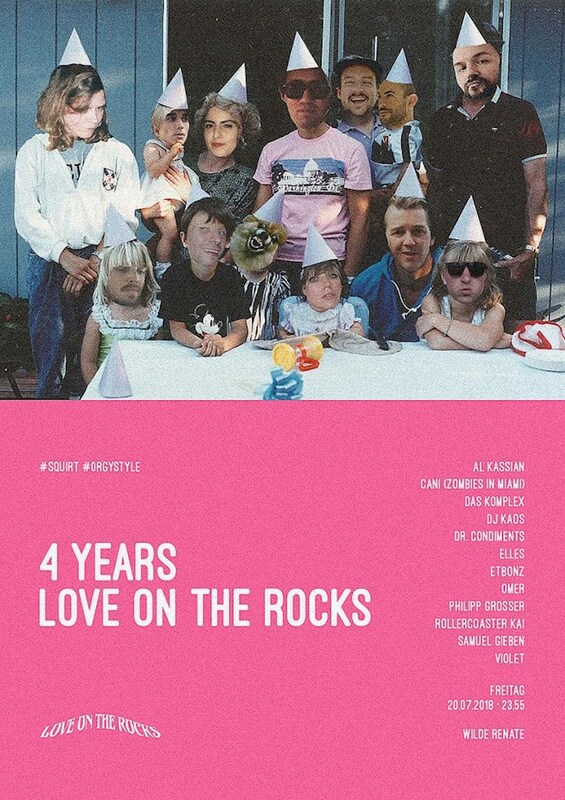 Hard to believe it has been more than four years since the first record on Love on the Rocks (LOTR) — the Berlin-based record label run by infamous squirting DJ Paramida — was released. To celebrate their 4th birthday and showcase the best of the label, LOTR has gathered friends and family from far and wide, from Wilde Renate regular and LOTR whizkid Samuel Gieben, to Violet and Elles, the newly signed duo behind the latest offering from the label, "A Life Lived In Fear Is Like A Life Half Lived”, to Etbonz, Portland based LOTR artist whose remix is one of four on the release. They’re joined by Omer, whose summer anthem "Bye" became a hit on LOTR last year, receiving plenty of spins in our rooms and worldwide. Al Kassian, remixer and upcoming artist for the label plays next door, alongside trippy Polish disco export and fellow LOTR crew Das Komplex, and many more. Prost!